In , WP_CONTENT_URL began to reflect current url scheme. so, Image url when insert from editor with https (and front is http) will have https. 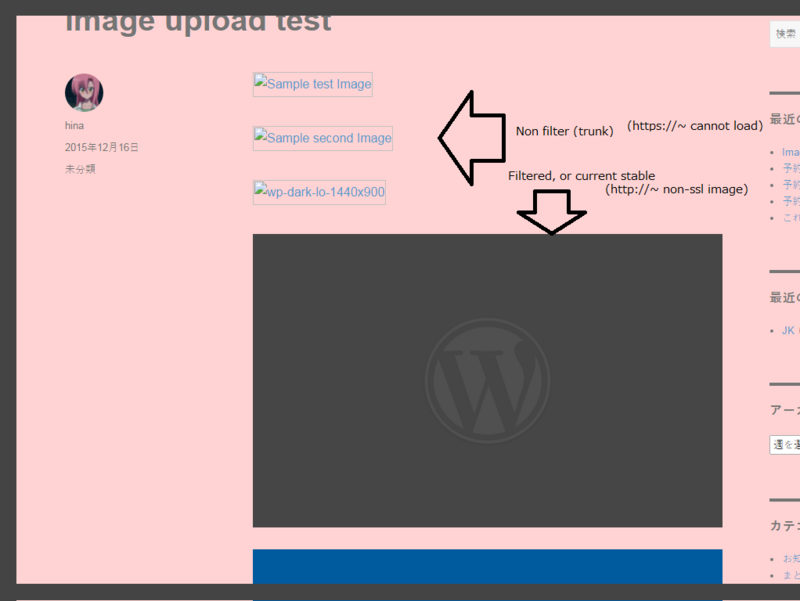 If wp_get_attachment_url's response filtered like below, it will well but it need some conditional branching. Thanks for the report. This definitely looks like a bug. WP_CONTENT_URL is used in wp_upload_dir() to build the URL to the uplods directory, which is then used throughout many functions in core. The one that is affecting you is get_image_tag(), which is used to build the HTML for an image before inserting it into a post. Related history can be found in #15928. @hnle Would you let us know the following please? What's the value of the "WordPress Address" and "Site Address" fields on the Settings screen? Are you using the FORCE_SSL_ADMIN constant in your wp-config.php file? Are you using the WP_HOME or WP_SITEURL constants in your wp- config.php file? in other side, in the current public env (4.4 stable) which using FORCE_SSL_ADMIN looks not have this issue.